Hi fellow dessert-loving friends! As you know, I’m all about trying to figure out a way to make desserts healthy. And while there are some ingredients that just aren’t going to be as health-boosting for you as a stalk of celery, there are ways to reduce the indulgent while upping the healthy. 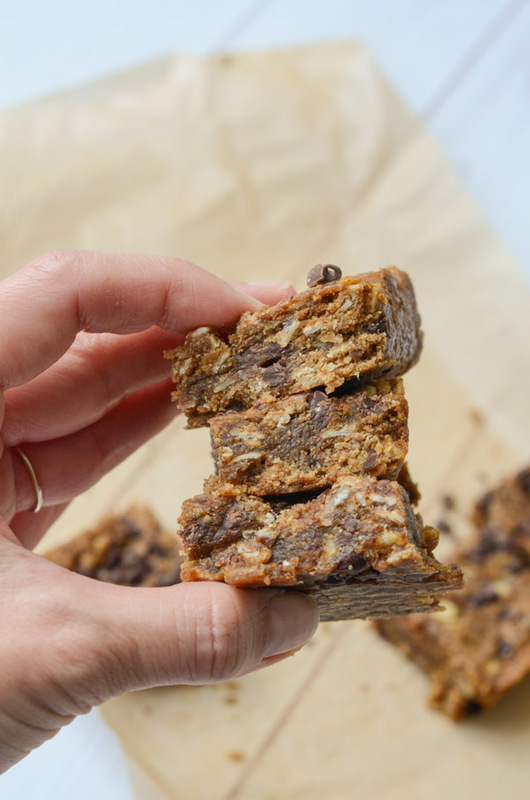 So, in today’s post, I’m sharing my latest Healthy Sunbutter Oat Blondies Recipe: Fudgy, Ooey-Gooey, and Delicious! Cake or Fudgy Blondies: Which Do You Prefer? Because either way, I got you covered! 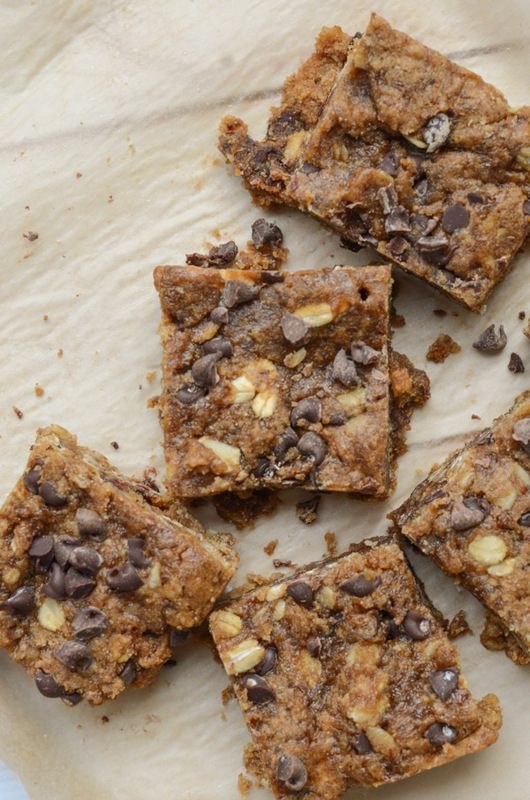 Stay here for fudgy and check out this recipe for cake-like blondies. Personally, my texture preference depends on my mood. For instance, some days I want cakey blondies and others I prefer ooey-gooey and fudgy! 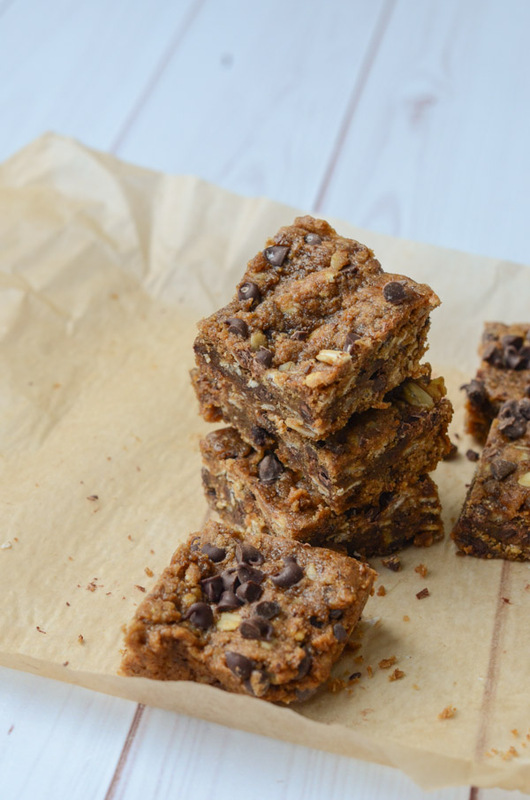 Unlike my Coconut Spelt Blondies, these are much more fudgy and rich in taste and texture. I think we can thank the sunbutter for that. Sunbutter is a great nut-butter-like ingredient in place of almond or peanut butter since sunbutter is made from sunflower seeds. So, it’s a seed-butter! Therefore, this could be great for any of you guys out there allergic to tree nuts. Don’t quote me, but there’s a chance you can still have sunbutter! Check with your doctor to be sure – these nut allergies are no joke, and it seems like an allergy to one can stretch out to similar foods. But it’s def worth looking into! Sunbutter is pretty darn healthy for you too. According to this article by Dr. Axe, sunbutter is high in protein and loaded with vitamin E and magnesium. And did you know a deficiency in magnesium can hurt your sleeping?! For example, I remember when I was having trouble sleeping, I wondered if a deficiency in magnesium could have been part of the cause. If only I had this recipe back then! Thanks to the sunbutter, I was also able to skip butter, vegan butter alternatives, and oil. The sunbutter covers all of that! 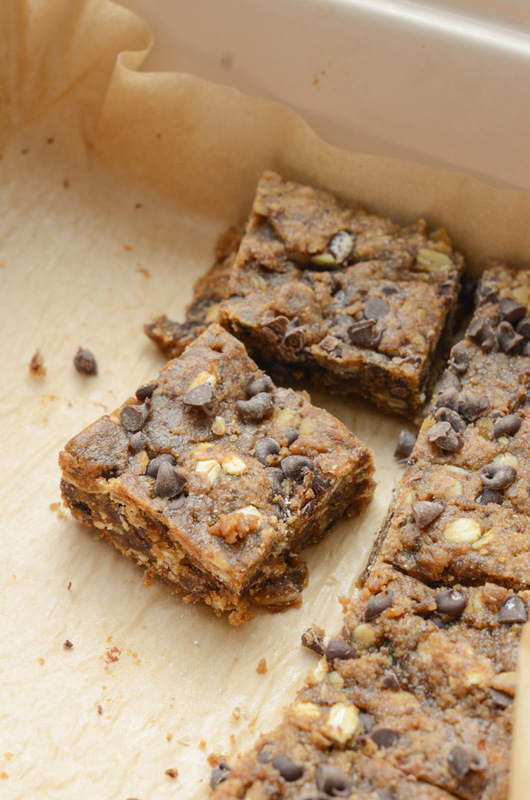 I mean, I won’t be eating a whole baking dish of these, but let’s be real…if you’re going to eat blondies, you’re going to eat blondies. At least you can make them healthier and sneak ingredients into your eats that have nutrition-boosting properties. Woop! 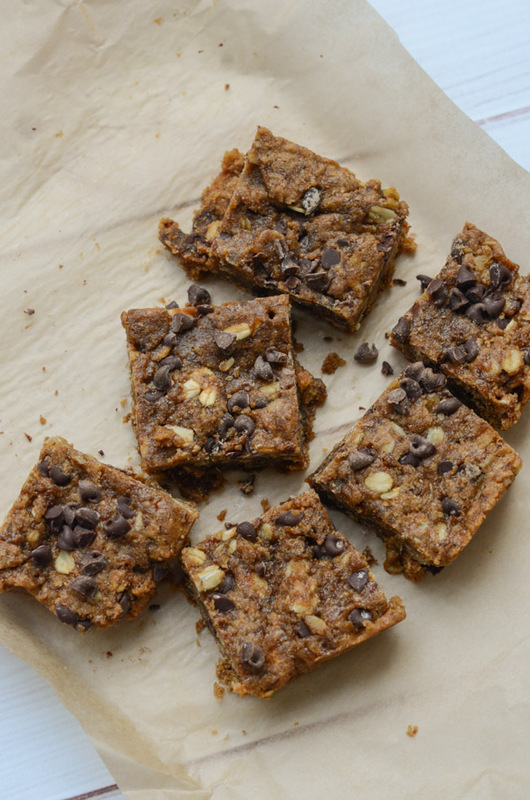 Because this Healthy Sunbutter Oat Blondies Recipe is so rich and delicious, I found I only needed one square to satisfy my dessert stomach. You have one of those too, right? A dessert stomach. When my regular stomach is full, I pretty much always have room for something sweet. And with this filling treat, one square will do the trick! Ready to bake this for yourself? 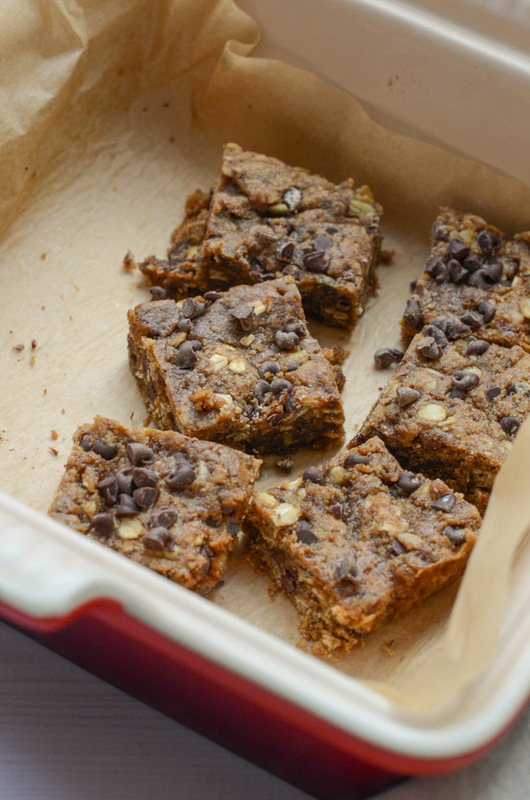 Here comes the Healthy Sunbutter Oat Blondies Recipe! Fudgy, Ooey-gooey, and delicious! 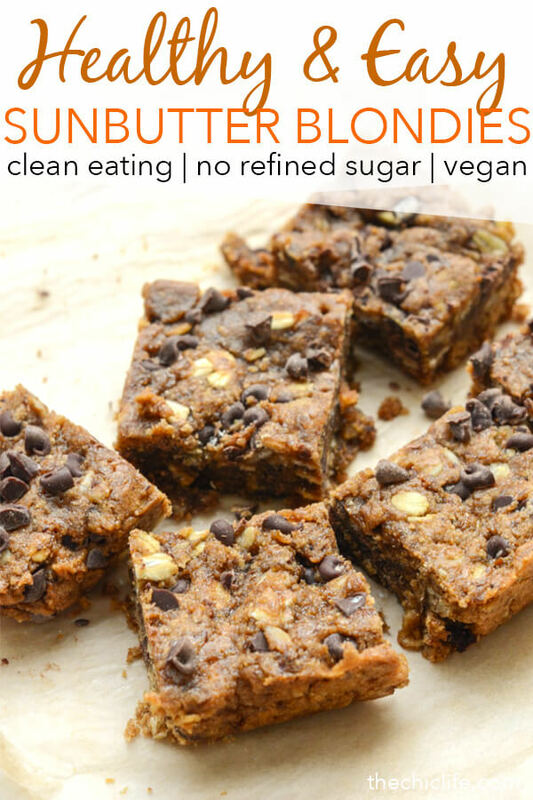 These Healthy Sunbutter Blondies are SO GOOD! Not to mention they’re clean eating and nut-free. 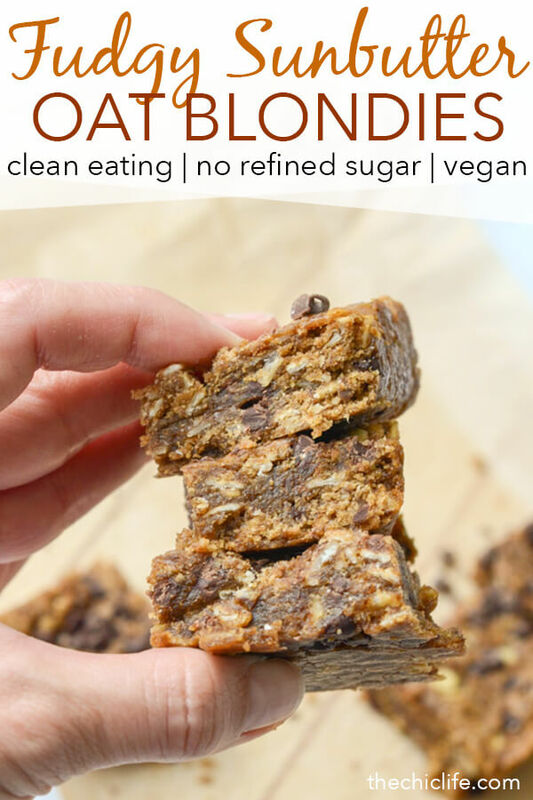 And they’re vegan blondies too! Pre-heat oven to 350 degrees F. Line a 8 x 8 baking dish with parchment paper (for easy removal). Prepare flaxseed egg and melt vegan butter, if you haven’t already. In a medium bowl, add flour, baking powder, and salt. Whisk to combine evenly. Whisk in chocolate chips. In a medium bowl, whisk vegan butter and coconut sugar until combined evenly. Whisk in flaxseed egg and vanilla extract until combined. Pour mixture into prepared baking dish. 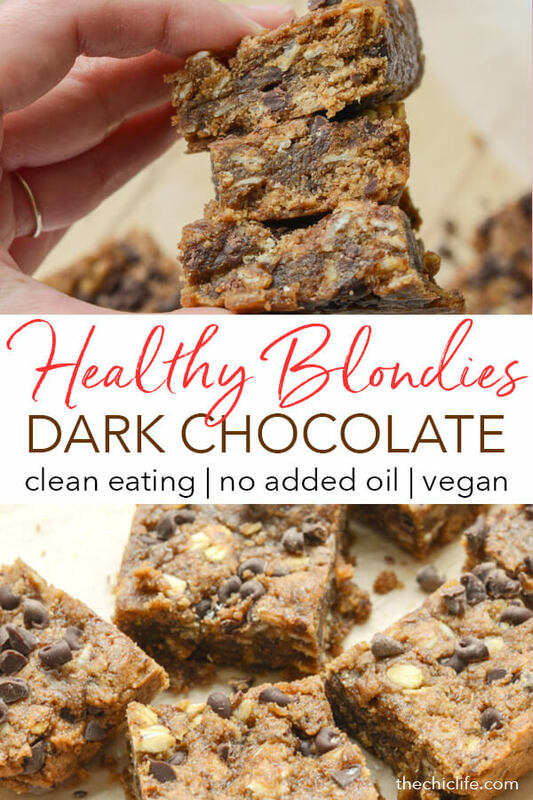 Bake until the blondies are cooked through (when a toothpick inserted comes out clean), about 20-24 minutes. Cool for about 2-3 hours (or 1 hour if you’re impatient like me), cut, serve, and enjoy! 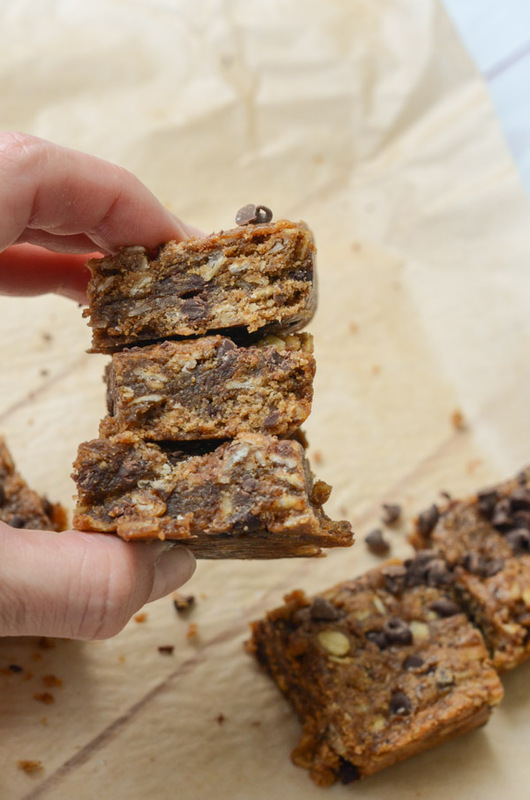 Thank you so much for checking out this Healthy Sunbutter Oat Blondies Recipe: Fudgy, Ooey-Gooey, and Delicious! 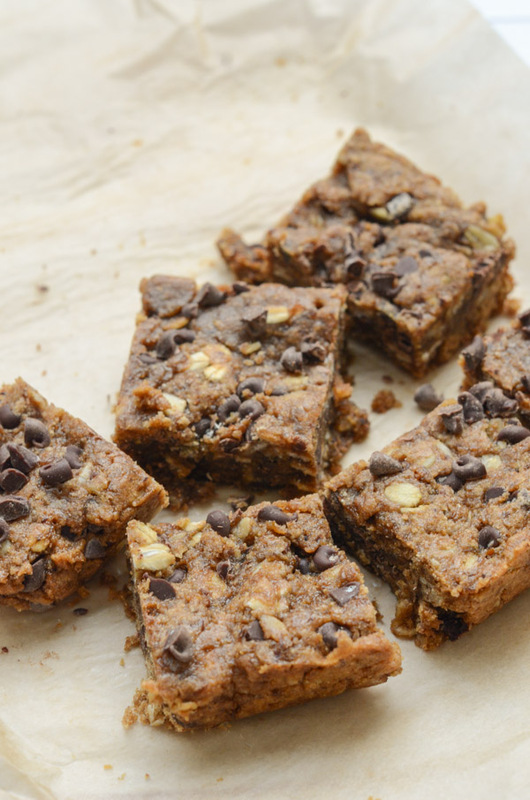 Hope you enjoy them if you try this clean eating dessert recipe. Please let me know what you think in the comments below! Cheers!